FICEP Steel Surface Systems (S3) is a high-tech engineering and research & development company that operates worldwide within the FICEP group. It manufactures machines and develops production management software for structural steel fabricators. FICEP S3 also provides installation and maintenance services for steel fabricating equipment. In addition, it provides after-sales services and spare parts, including 3D-printed parts. The daVINCI Automatic Paint Line primes and paints structural steel. In its development, FICEP S3 faced several constraints and decided to see if they could be resolved using HP’s Jet Fusion 3D printing solution. 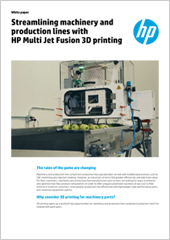 Download the case study to learn how HP 3D printing technology helped FICEP S3 move beyond the limitations of other technologies.